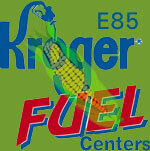 E85 is becoming available at varous Kroger fuel stations in the Dallas and Houston areas. Some Kroger stores in the Houston area are now able to offer Texas motorists the benefits of ethanol fuel, thanks to the installation of Dresser Wayne's VistaT 387 E85 fuel dispensers in the summer and fall of 2006. Kroger believes that drivers are becoming interested in alternative fuel options, and this trend will continue to grow as access to alternative fuel becomes more convenient and gasoline becomes more expensive. The Vista 387 E85 dispenser, built by 'Dresser Wayne' is the ethanol pump chosen by Kroger, making it possible to safely provide ethanol to the traveling public. Kroger operates more than 500 supermarket fueling stations nationwide, including more than 60 in Texas, all of which are located next to Kroger retail grocery stores. Kroger is expected to seek additional opportunities to offer E85 fuel both in Texas and throughout the nation. Kroger operates more than 700 convenience-store fueling sites nationwide. Wal-Mart and Sam's Club are also considering selling E85 across the nation. The collaboration is part of a GM campaign to boost the use and awareness of ethanol-based E85 fuel in the U.S. As part of the partnership, GM will promote the availability of the fuel with consumer and dealer outreach. The partnership is similar to those GM entered into with VeraSun Energy the Sioux Falls area and more recently in the Chicago and Minneapolis areas, as well as earlier this year in California with Chevron Technology Ventures and Pacific Ethanol. GM also announced that it would extend its partnership with the Governors Ethanol Coalition (GEC) to provide new E85-capable vehicles for use in GEC member states. This collaborative effort, which was launched in early 2005, is designed to increase awareness of ethanol and flexible fuel vehicles, and to promote the increased use of E85 as a renewable, alternative transportation fuel that is able to meet the demands of today's drivers, GM said. 8500 Hwy 6 N. @ West Rd. 2224 I-45 @ Loop 336 N.
Get Directions 11565 Hwy. 6 S.